My students love fables, and I love using them in my classroom. 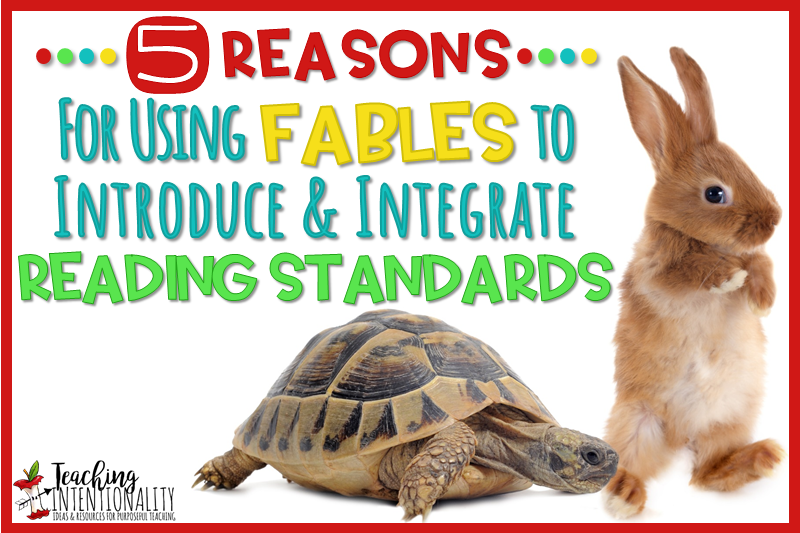 Fables are great for introducing reading standards, as well as helping my students see how these standards work together to help them better understand literary texts. As I have pointed out in my last post, 4 Tips for Helping Students Grasp Theme & Message, fables are a great place to start teaching students how to retell stories, analyze characters, determine the central messages of the stories, and understand key trait vocabulary. When teaching this genre, students also get a greater sense of how these learning targets are interdependent. First of all, fables are a short text. They do not have a lot of details to sift through when determining what’s important. 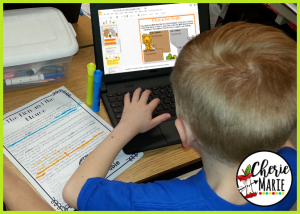 This makes it easier for students to retell or summarize the text in just a few sentences. They can use any type of organizer to do this. 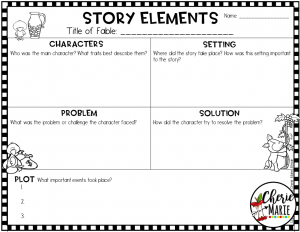 I like to use a Somebody, Wanted, But, So, Then chart or a Story Elements graphic organizer. Students can also do a recount of the fable by writing a summary in their Reader’s Notebook. Sign up for my free resource library to download these graphic organizers and much more. Click the “Home” page to register. Since fables usually have only one or two characters, they are great for introducing character analysis. Fable characters aren’t complex, so it’s much easier for students to analyze them. When introducing this genre, I try to use fables that have two characters with opposing traits. 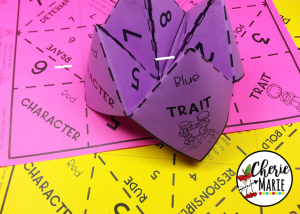 This makes it much easier for students to identify traits that best describe the characters. It also helps students see how these opposing traits become important to the central message, or moral. Bridging an understanding of how these two standards (CCRA.R2 & CCRA.R3) work together is so important to students’ comprehension of literary texts. I begin a close read by having students take a look at what a character says, does, or thinks to determine the most important traits of each character. Since the text is short, it’s easier for students to point out these things. 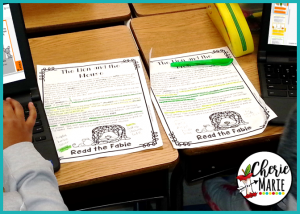 While students can sometimes make a list of traits for each character and even provide valid evidence to support each, it is important to have them focus on one or two traits that are MOST important to the plot. As teachers, we feel the need to validate our students’ thinking. However, we need to teach them how to discern between those traits that really influence the plot and those that do not. It is then that students can see how traits influence the characters’ choices and actions, which in turn, influence the outcome for the characters at the end. 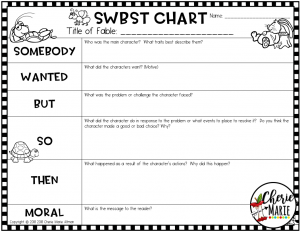 This is where students can begin to determine the message or moral of the story. For example, when reading The Ant and the Grasshopper, students can say Ant was cautious, hardworking, determined, wise, responsible, etc. All are great traits for describing Ant. However, wise is an important trait to the events that unfold because Ant knew winter was coming and used good judgment to put up food. Hardworking is another important trait because this resulted in Ant being prepared for the winter. On the other hand, Grasshopper was friendly, foolish, lazy, carefree, optimistic, etc. Again, these are all great traits for describing Grasshopper, but his foolishness influenced the choice he made: He knew winter was coming, was even warned by Ant, and he still chose to procrastinate. Also, his laziness was what led to his demise at the end. When students have an opportunity to look at these traits in juxtaposition, they begin to see the stark contrast between these traits. They also begin to notice how this plays a role in what happens to the characters in the end and why this happened to them. This is when fables make it easier for students to determine the moral of the lesson. Students begin to see how what the character is like (traits) influences what choices the character makes and the sequence of events that result from these choices. Even if the characters do not have opposing traits, students can still determine how the traits influenced the character’s actions and the result of these actions. Note: I like to use fables that don’t state the moral at the end since this is what I want students to determine on their own based on what they read. As a third grade teacher, one thing is very apparent. Students need opportunities to build trait vocabulary. At the beginning of each year, my students really struggle with the precise words to describe characters. This is such a challenge. I’m a believer in intentionally providing different opportunities to help students gain an understanding of this vocabulary. I do this through various activities and strategies: whether it’s through task card activities, Marzano’s vocabulary strategies, the use of the Quiz-Quiz trade Kagan structure, word association activities, readers’ theater, or role-playing. Fables are perfect for introducing both positive and negative trait vocabulary that is commonly found throughout the themes and messages of literature. 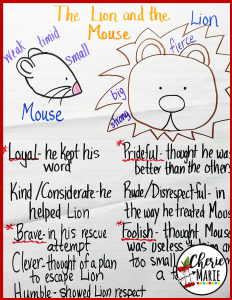 Think of all the character traits fables teach. These stories are intentional in teaching about characters who are wise, honest, prideful, clever, patient, loyal, greedy, selfish, reliable, respectful, trustworthy, courageous, considerate, sly, irresponsible, etc. They are great anchor texts to use as a foundation for understanding these qualities. Students can also apply this understanding when describing characters in other types of literary genre. Fables are also wonderful for helping students with nuances in trait vocabulary. For example, many times my students use wise and clever interchangeably. I use fables as an opportunity to demonstrate the differences between these words. Being wise is using your knowledge and experience to make good judgments. Ant was wise because he knew that seasons change and food would be scarce in winter, so he used that knowledge and experience to make the choice to prepare for winter. Being clever is using your knowledge to get what you want. Crow, in The Crow and the Pitcher, was clever because he used pebbles to make the water rise in a pitcher to get water. To see more ideas for teaching shades of meaning, visit my post Understanding Characters Through Shades of Meaning. I also try to help them see the difference between being clever and being sly. Clever can be good or bad. It is a more neutral trait. Whereas, sly has a more negative connotation in that it is self-serving. These are the very shades of meaning between character traits that help kids better understand literary texts. For example, these words illustrate differences in the intent of the character. There’s one more thing I would like to share about the morals of fables. Sometimes if a fable is a bit more complex in its message, I like to introduce the moral to students first. I begin by talking about what it might mean before diving into the fable. This frontloading is effective when students need that support. They have the message to the reader before them as a purpose for reading. As students read, they are looking for details that support this message or moral. This is a great strategy for my struggling readers who have difficulty making inferences. 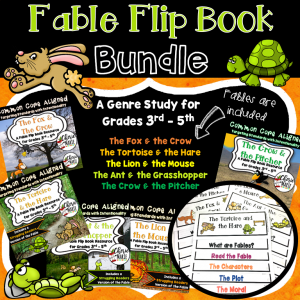 If you are searching for fables resources to help support your instruction, check out my fable flipbook series. 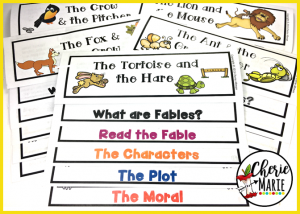 Each resource includes the fable, as well as carefully crafted questioning intentionally focused on analyzing characters, examining the plot, and determining the moral of the fable. These resources were created to integrate key ideas and details standards to better assist my students with core learning targets. 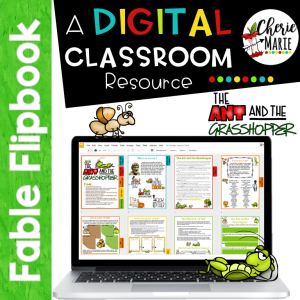 These resources are in both PDF format and digital format for use in Google Classroom or in any other digital platform. Sign up for my free resource library if you would like to try samples of these resources. Just go to my home page and register for free, exclusive resources.